21/01/2012 - Violence flared on the streets of Lisbon as members of the right-wing Portuguese nationalist party clashed with supporters of the left wing, indignados group. The fascist demonstrators threw a lighted flare and used flags they were carrying to attack the indignados. Police had to intervene and separate the two factions. 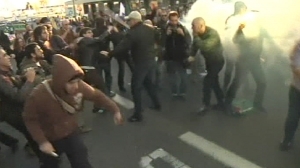 The fighting erupted during a planned demonstration to protest against the country’s austerity measures. Thousands marched to parliament chanting slogans against the Troika – the IMF, European Central Bank and European Commission. On Wednesday, the government, unions and employers signed a pact to make it easier for crisis- hit companies to hire and fire, cut redundancy pay-outs and the number of holidays. Officials from the Troika, at the end of a three day visit, praised the government for the reforms required to meet the 78 billion euro rescue package.